View from my Hotel Room this week! 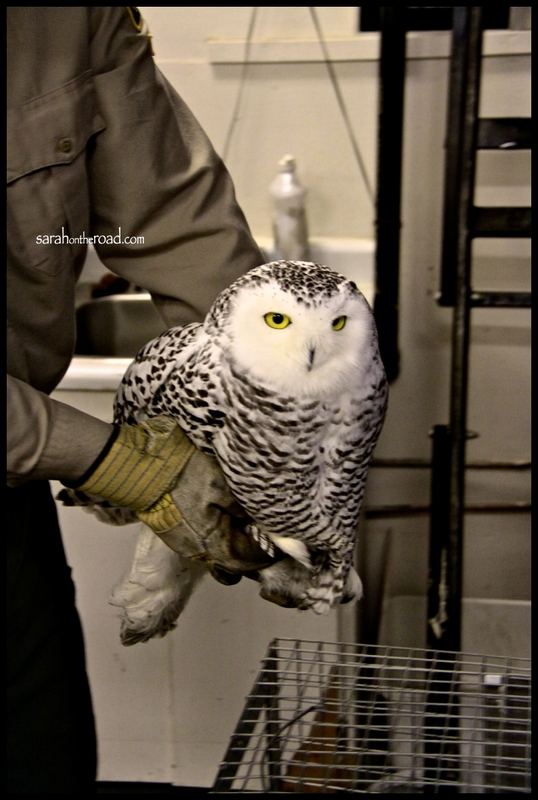 This entry was posted in Wordless Wednesday on November 30, 2011 by Sarah on the Road. Last night I braved the cold temperatures, with some friends…and headed down to the end of the road. We were in search of the Northern Lights. Markus and Mike also came prepared to do some light painting…some of the things used last night were glow sticks, head-lamps, battery operated Christmas lights and even an off camera flash to ‘freeze’ ourselves in the photos! I had fun taking a photos, but also being a model…and even ended up practicing painting my name in a photo! All of those photos were taken by Markus and are on his camera. They looked awesome in his camera, but can’t wait to see them. I’m going to share with you some of my favourite photos that I took from last night. My absolute fav was the LAST photo I took before we came back to town. 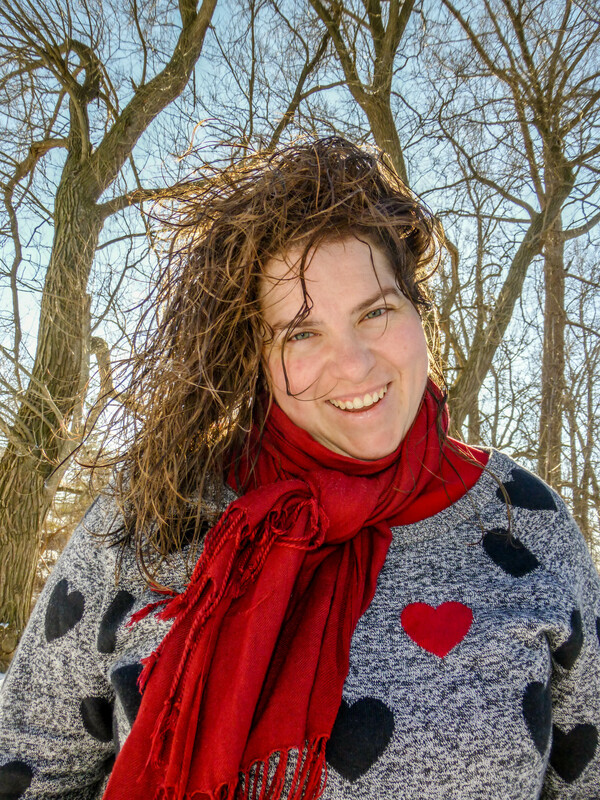 I had my camera on a 10second timer…just so I could get in the frame. Then stood with a glow stick in each hand and made circles…first at my sides, and then over my head–then put them together in one hand and made a HUGE circle. While I was doing this.. I had Markus and Mike directing me…and I’m loving the result for my FIRST attempt at light painting with glow sticks! The lights were out, but the stars really stole the show! Aaron and Mike were walking down the road with their lights…(to get in position for their light painting) as I was taking this photo. But I really liked the random lights streaking through the photo! 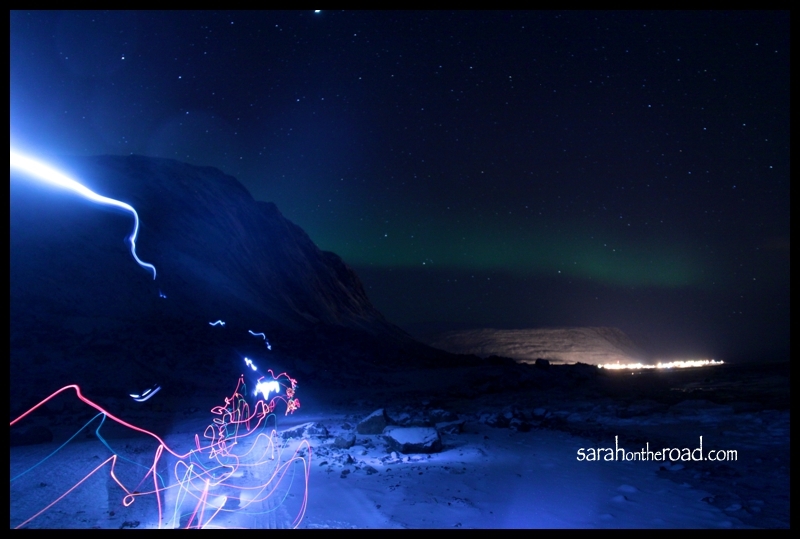 Here’s another shot of the northern lights as they dance over the lights from Pangnirtung. It was a fun night. I managed to ‘remember’ what settings to use on my camera–even though I checked in about them! I also learned how to set the ‘white-balance’ on my camera. Thanks for the invite. It was great shooting with you guys again. Every time I learn so much, thanks for being willing to answer my questions. 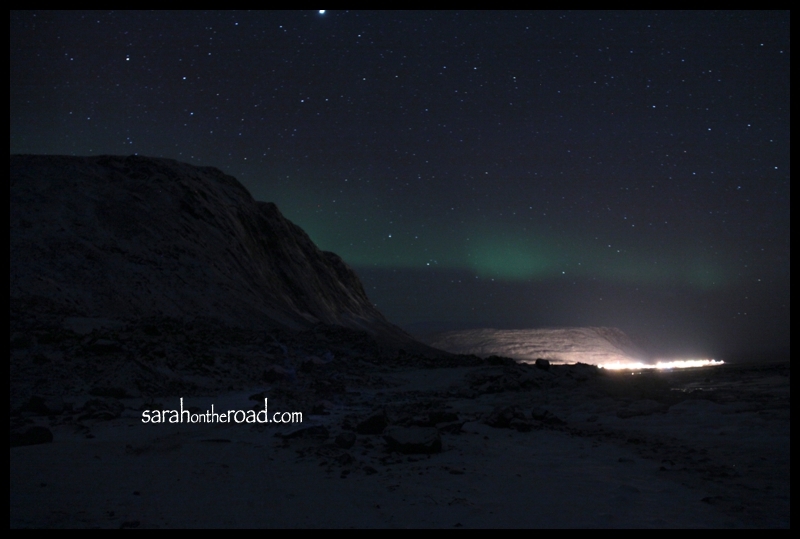 This entry was posted in Life in Nunavut, Photography and tagged Pangnirtung on November 27, 2011 by Sarah on the Road. Isn’t she gorgeous? She was badly injured…a group of Ravens had been attacking her. I heard from someone that a group of 20-30 ravens had been swarming and attacking her. Someone said she could only fly for 10feet before dropping back to the ground. Then the Ravens started swarming her all over again. While I was there looking at her she was very still, and didn’t move much at all. Just watched us with her big eyes. Sadly she was too injured to survive and the Regional Office ordered her to be euthanized. I heard some talk that they were going to send her to the taxidermy so at some point she will come back and be put on display in Pang. It was really neat to see her up-close though. It was a reminder of how sometimes it really is the survival of the fittest and how much I don’t like Ravens! 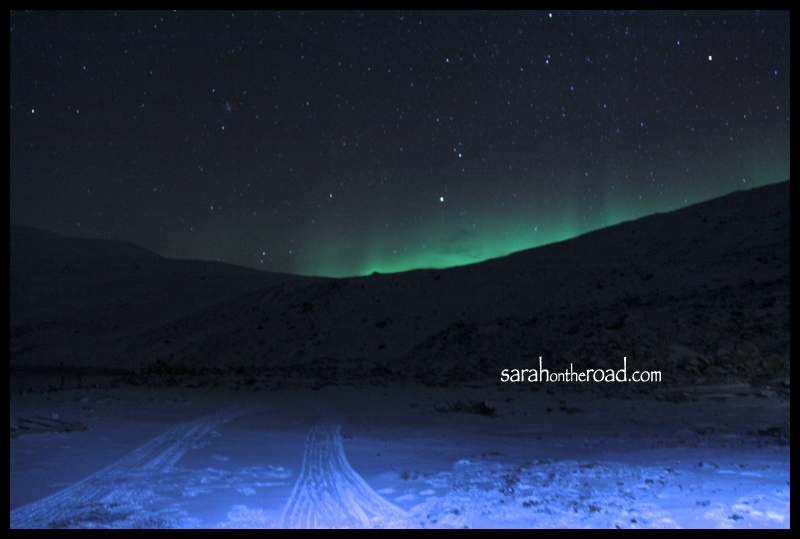 This entry was posted in Life in Nunavut on November 26, 2011 by Sarah on the Road. 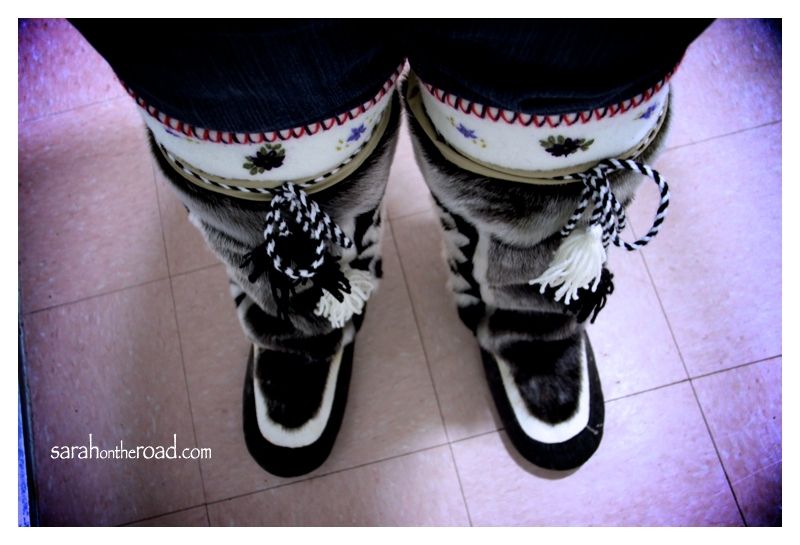 When I lived in Pangnirtung in 2009, I admired from a far people’s kamiks. I really wanted a pair. I was preparing to live in the south again, where I couldn’t wear them all the time…as with some things in life, the timing was not right, so I waited. This summer when I was hanging out with my friend Rosemary I mentioned how I wanted a pair of kamiks. She told me then her Grandma makes really nice kamiks and often sells them. She told me what price to expect to purchase a pair…and I stored this information away. Fast forward to about two weeks ago. I had the opportunity to visit the Arctic College Campus here in Pang. I visited the Fur Production and Design Class. The students were very busy quietly working away on the sewing their kamiks. I was in awe looking at the group of women working. My inner crafter and seamstress that I haven’t tapped into was SCREAMING out to me…I so wanted to join their class! But that just isn’t possible with my job. Every student had decided on a different design/style of kamik to make. There are so many beautiful styles and patterns to choose from. Mary Battye is the elder that is teaching the art of kamik making. Yes, it is an art. Before you even pick up a needle to sew…there are hours of skin preparing that have to take place. I no expert, and don’t know all of the steps to create a pair of kamiks–but trust me it’s a lot. Mary is also Rosemary’s Grandmother. One of the students helped me ask Mary if she’d make me a pair of kamiks. I had to ask for help because Mary only speaks in Inuktitut. Mary agreed. Mary took a good look at my ‘big’ feet, and ‘muscular’ calves–that I can never get leather boots to fit around! A few days later I faxed over an outline of my foot…(I was worried that with all the work to make a pair they wouldn’t fit right, because of how big and wide my feet are). I shouldn’t have been worried. They fit so well probably the best fit of ANY shoe I’ve worn my whole life! Put on the spot of how of trying to decide what kind of design to pick I couldn’t. So I asked if I could think about what ‘design’ I wanted and I’d let her know the next day. I’m so happy I choose the flower design. Today I went to pick them up! It was like Christmas came early… last night I knew that they were ready, and I honestly had a hard time sleeping because I was so excited. They were perfect. They are gorgeous. They are mine! Here’s a close-up of my Duffel socks, such beautiful embroidery along the top. The Duffle socks also have a little slipper that goes over the foot of the sock. After getting them home, I kept looking at them…turning them over examining them from every angle looking at all the stitches, and the details! I think they look pretty snazzy on. However, I already know I’m going to have to learn how to walk in them without totally wiping out. 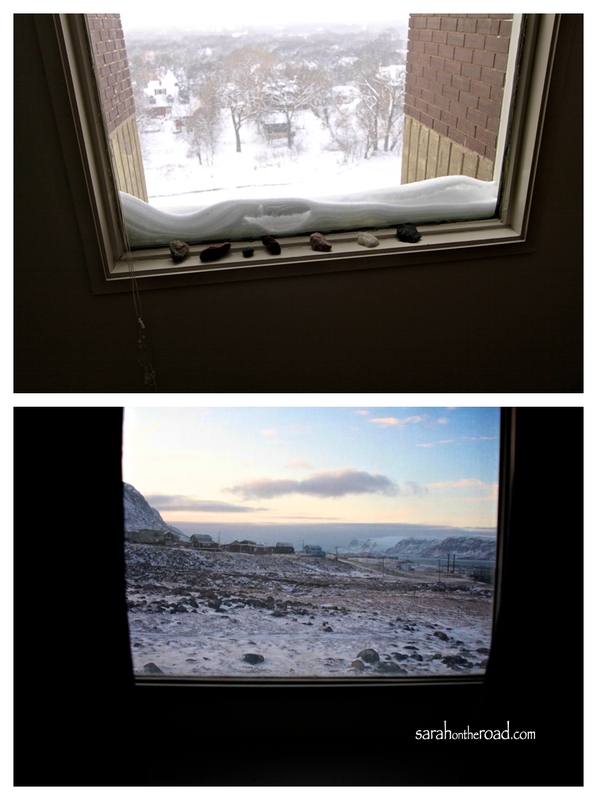 When the wind blows the snow out of town, it polishes up whatever snow was left on the roads. The result is pretty slipper roads. Sometimes it’s a battle to stay upright in my southern shoes…but with Kamiks until you get use to walking in them are a bit tricky. 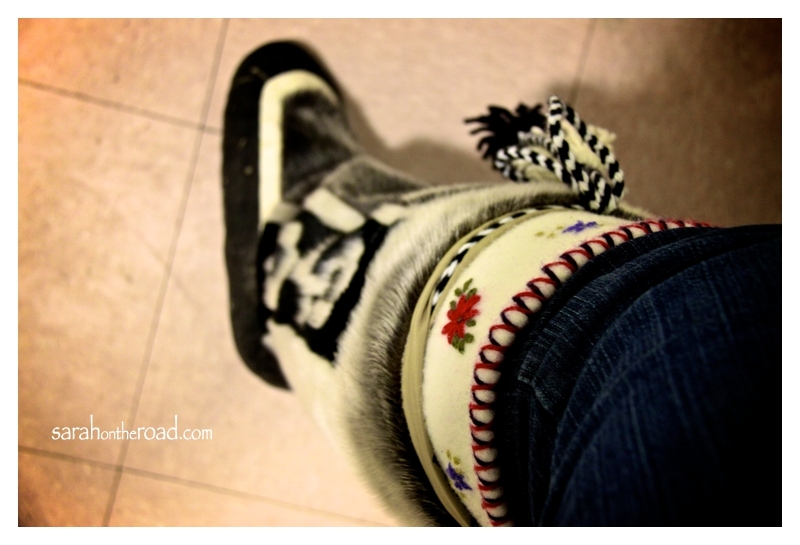 Traditionally Inuit woman would chew on the bottom skin to mould it to form around a foot. There is a ‘tool’ that helps with this process now. But some women still believe in the ‘traditional’ way of chewing. I forgot to ask if mine were ‘chewed’ or shaped using the ‘tool’. It’s all in the details! 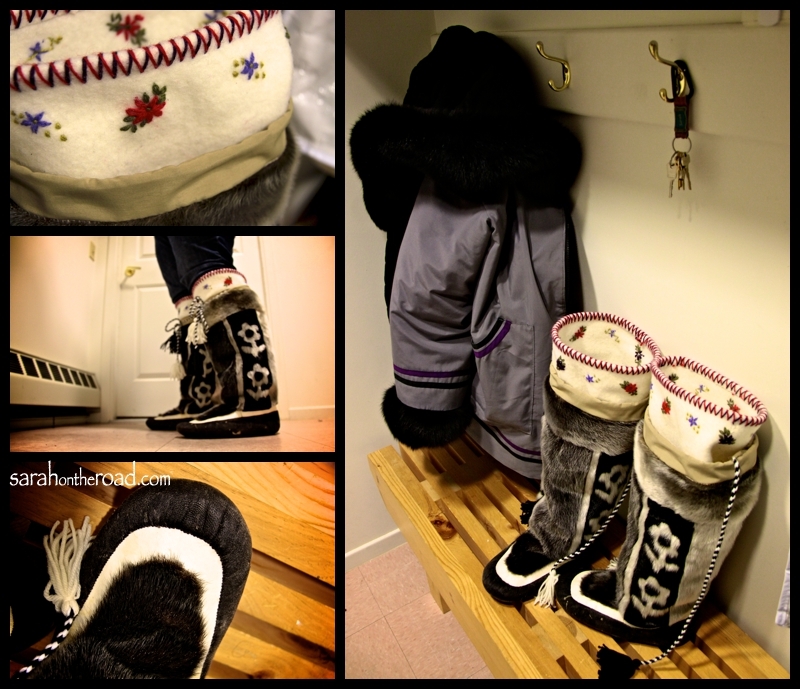 My handmade parka beside my kamiks. 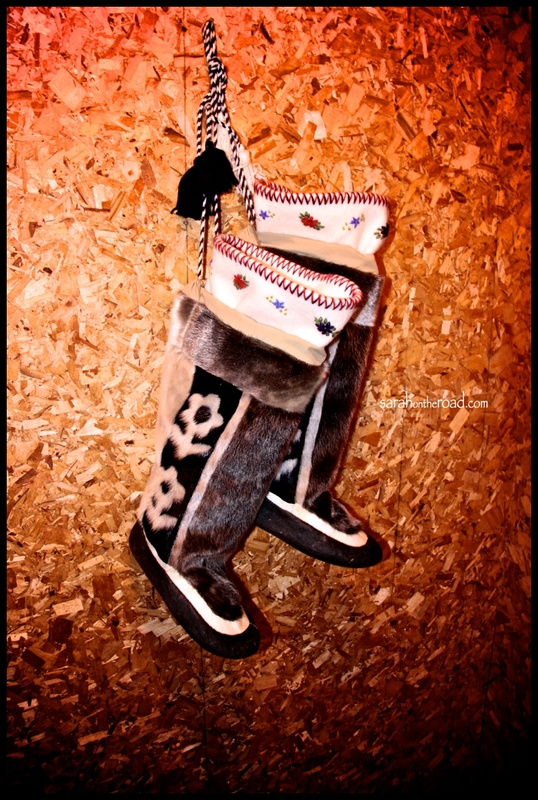 If you haven’t already guessed these are made out of sealskin. Hunted by local hunters…where all parts of the seal is used-for food and clothing. The hides used to make these kamiks haven’t been tanned. So to store them I have to keep them cold-or they will rot, and the fur will fall off. The other thing I’ll have to get use to is the smell of sealskin…although when a friend looked at them, and smelt them they said they weren’t as smelly as they could be. But they do smell like a seal! Winter storage place in my ‘cold porch’…Summer storage will be in my freezer. I’m so happy that Christmas came early! Mary did a fabulous job. They are gorgeous and such a work of art. They were worth every penny plus so much more. 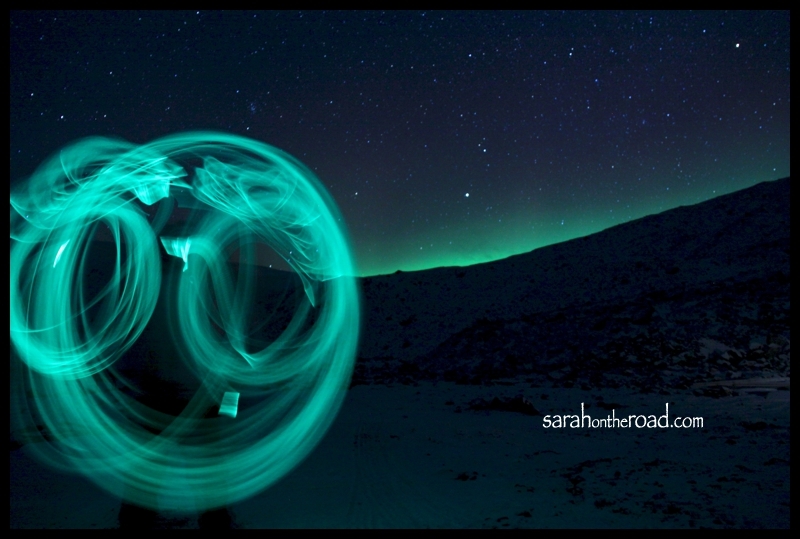 This entry was posted in Life in Nunavut on November 24, 2011 by Sarah on the Road. 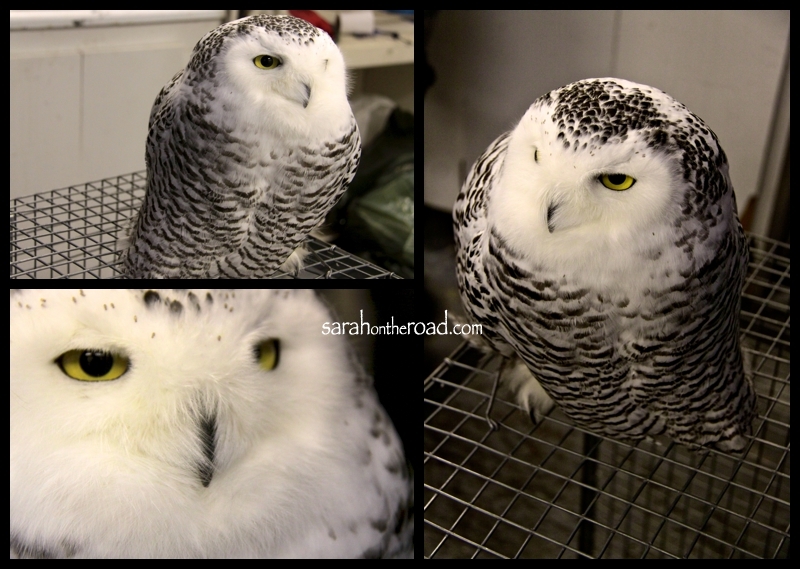 This entry was posted in Wordless Wednesday on November 23, 2011 by Sarah on the Road.